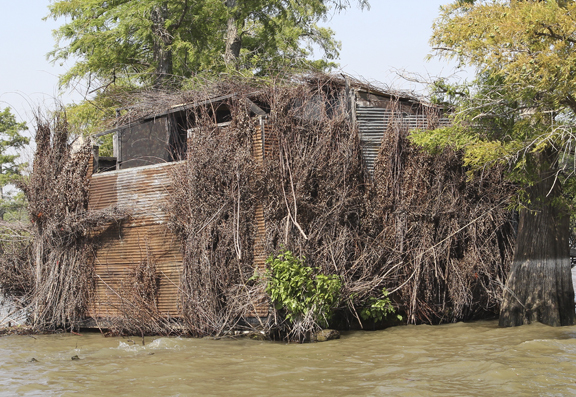 Beginning Oct. 15, the AGFC will dismantle and remove blinds left on St. Francis Sunken Lands WMA and Big Lake WMA. Permanent blinds on two northeastern Arkansas wildlife management areas will be removed before this year’s waterfowl season. Commissioners with the Arkansas Game and Fish Commission unanimously approved a plan to remove the blinds on Big Lake and St. Francis Sunken Lands WMAs. The vote came today during the Commission’s monthly meeting. Permanent blinds are not allowed on any of the state’s other WMAs. Last year, AGFC Director Loren Hitchcock stopped the practice of sportsmen accessing and manipulating habitat on Big Lake, St. Francis Sunken Lands and Dave Donaldson Black River WMAs. The practice is not allowed on any other state WMA. The blind removal plan will allow hunters, who claim a blind, the opportunity to remove the blind and any personal equipment between Aug. 30 and Oct. 14. Hunters would first be required to obtain a blind removal permit from the AGFC. The free permits will be available beginning Aug. 20. To acquire a permit, contact the Jonesboro regional office at 877-972-5438 Monday-Friday, 8 a.m.to 4:30 p.m. The removal process allows specific types of vehicles and equipment to be utilized in the removal process. The permit points out that no habitat degradation will be allowed on the WMAs. Beginning Oct. 15, the AGFC will begin dismantling the blinds. Decoys also will no longer be allowed overnight on the three WMAs.